Table Air Circulator Fan offers an aerodynamic Turbo Design for maximum air movement. Use as a fan for intense cooling power or as an air circulator for the whole room. Increased air flow allows the air conditioning and heating systems to be used at lower settings to help you save money year round. Mount fan to wall to save space. Variable tilt fan head pivots up to 90 degrees. Fan features a powerful three-speed motor and removable grill for easy cleaning. 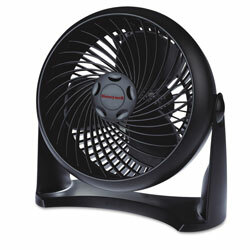 Black Fans from Honeywell! 1356 In Stock today.